The Gaslighting of America continues as Donald Trump and his comrades at State TV (aka Fox News) manufacture ever more twisted versions of reality. They must have a fabrication factory working 24/7 to keep their supply of crackpot theories and fictional accounts of current events flowing. And that factory is undoubtedly located in China and staffed by ten year olds who have been instructed to dumb everything down to the seven year old level. Ingraham went on to chastise a series of liberal news commentators for criticizing Trump’s White House invitation to Kanye. Except that those commentators were not criticizing the invitation. They were criticizing Kanye’s insane antics and rhetoric. The notoriously buggy rap star went on a ten minute monologue of sheer madness. Just a few examples included his contention that putting on the MAGA hat made him feel like Superman; that Trump’s campaign exuded male energy that resolved his daddy problems; that the 13th Amendment to the Constitution (abolishing slavery) should be repealed because office buildings don’t have thirteen floors; and that Trump should fly in a non-existent, hydrogen powered plane. 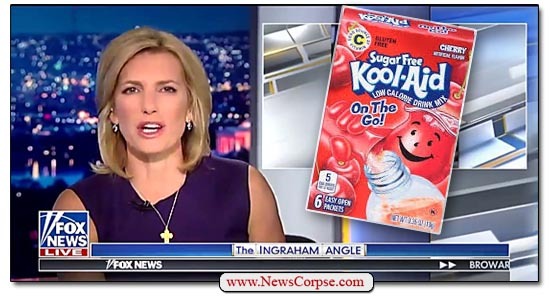 Ingraham couldn’t help diving into a ludicrous round of “whataboutism” in response to complaints that Kanye called himself a “crazy MF’er” in the Oval Office. That was widely regarded as both uncivil and disrespectful. So Ingraham reached back a quarter of a century to ask what about Bill Clinton’s disrespectful behavior with Monica Lewinsky. That’s a far stretch to put forth an absurd comparison. But for the perverse obsessions of the Republicans, that would have been a private affair. Kanye was dropping F-bombs on national television across the desk from the President. Apparently Ingraham is suffering from a severe case of willful amnesia. It’s an infectious disease that is spreading throughout the Fox News studios. Contributor Dana Loesch has it. She appeared on Fox and Friends and rattled off the names of some notable celebrities who were guests of President Obama and then declared that that “no one attacked any of those individuals.” Likewise, Tucker Carlson and Sean Hannity made the same case that only the famous friends of Trump were subject to criticism. Clearly these ultra-partisan blowhards have lost a considerable quantity of the brain functions that control memory, poor things. Democratic leaning celebrities have taken far more abuse from the right than vice versa. They are maligned as communists, traitors, hateful and hostile. All of that and more simply for expressing well reasoned opinions. But Kanye goes off on certifiably insane rants about sleep deprivation and he’s hailed as a political genius. And the right still has never apologized for the outright vulgar and vicious attacks by their favorite washed up rocker, Ted Nugent.